What a day! The beginning of the new quarter, the new month and the new week was undoubtedly the triumph of oil bears. Thanks to their attack crude oil lost almost 3% in one day, which was the biggest decline since weeks. What impact did this drop have on the short-term outlook? Where are the nearest supports? For these and other questions you will find answers in today's alert. Let's take a look at the charts (charts courtesy of http://stockcharts.com). In our Thursday’s alert, we wrote that black gold slipped under $65 and the CCI joined the Stochastic Oscillator by generating a sell signal. Additionally, (…) recent declines materialized on increasing volume, which suggests that currency bears didn’t say the last word and further deterioration is still ahead of us. Looking at the daily chart, we see that the situation developed in line with the above scenario and we didn’t have to wait long to see oil bears’ determined attack during yesterday’s session. Thanks to Monday’s price action, light crude moved sharply lower, breaking below last week’s lows and slipped to the 50-day moving average. Although we can see some rebound from here, the sell signals generated by the indicators remain in the cards, supporting oil bears and lower prices – just like the volume, which increased during yesterday’s decline. How low could light crude go in the coming days? In our opinion, if light crude drops under the blue moving average, we’ll see (at least) a test of the support area created by the March lows and the barrier of $60. 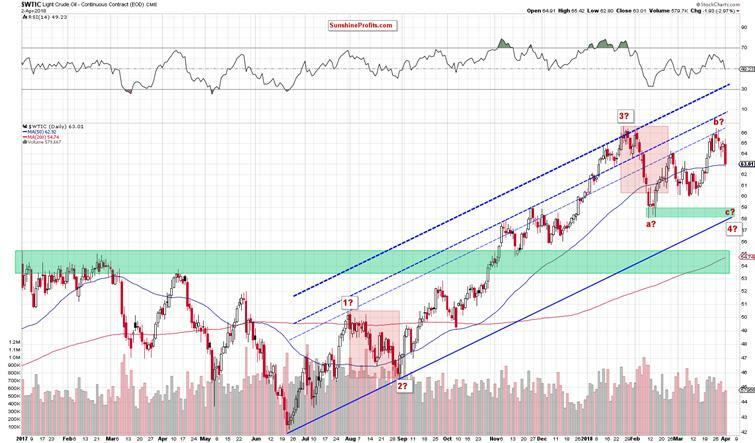 However, when we take into account the zigzag pattern seen on the above chart, the next downside target for oil bears will be the green support zone based on the February lows and the lower border of the medium-term blue rising trend channel around $58.20 (if you want to know more about the above-mentioned big zigzag and Elliott wave theory, we encourage you to read our Oil Trading Alert posted on March 27, 2018). The pro-bearish scenario is also reinforced by the long- and medium-term picture of black gold about which we wrote in our last commentary. Let’s start this section with the medium-term chart. The first thing that catches the eye on the weekly cart is an invalidation of the earlier tiny breakout above he upper border of the blue consolidation. This is a negative development, which suggests further deterioration and a test of the lower line of the formation in the coming week(s). When we zoom out our picture, we’ll see one re bearish factor, which could be use in the coming week. What do we mean? Another unsuccessful attempt to break above the major resistance – the 200-month moving average, which continues to keep gains in check since the beginning of the year. 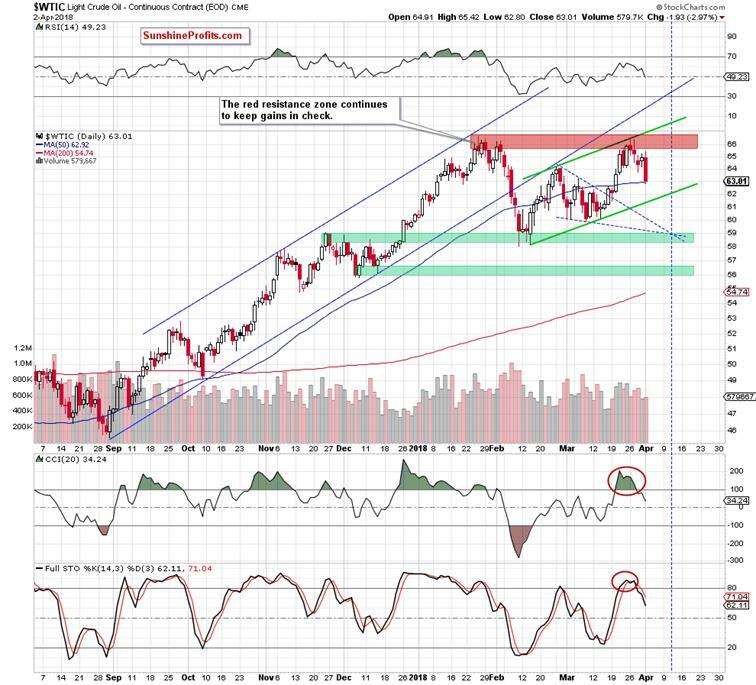 Additionally, the sell signal generated by the Stochastic Oscillator remains in play, supporting oil bears and lower prices of black gold in the coming month. 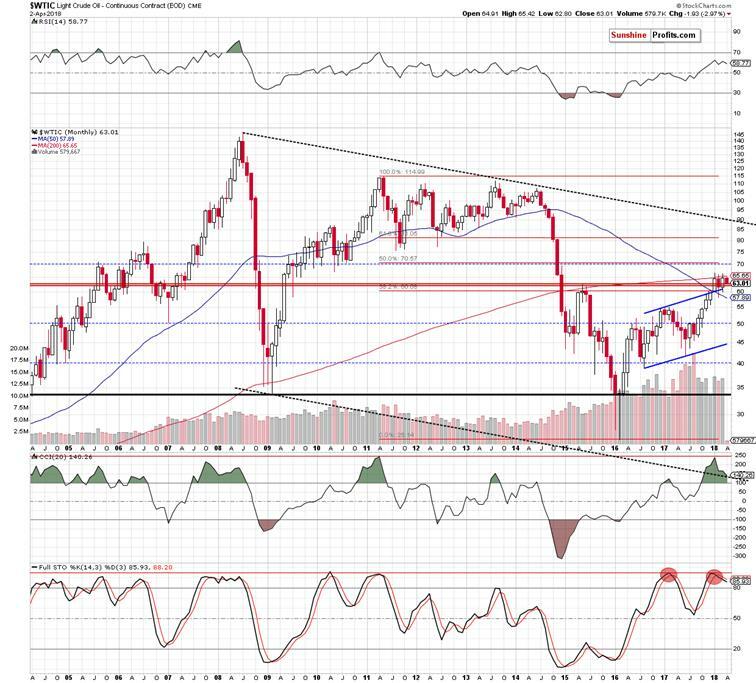 Summing up, crude oil extended losses, invalidating the earlier breakout above the upper border of the blue consolidation (seen on the medium-term chart) and failed to break above the major resistance – the 200-month moving average (marked on the long-term chart) for the third time in a row. These bearish developments increase the probability of further declines and a test of the green support zone in the coming week. If you enjoyed the above analysis and would like to receive free follow-ups, we encourage you to sign up for our daily newsletter – it’s free and if you don’t like it, you can unsubscribe with just 2 clicks. If you sign up today, you’ll also get 7 days of free access to our premium daily Oil Trading Alerts as well as Gold & Silver Trading Alerts. Sign up now.